We know Jesus is the Good Shepherd. The Bible also addresses bad shepherds. The book of Jeremiah talks about this, but it’s easy to miss it if we read too fast. Quoting God, Jeremiah writes, “My people are lost sheep. Their shepherds led them astray.” As a result, they’re lost, wandering around and not having a safe place to rest. The shepherds aren’t doing their job. If they lead their sheep anywhere, these bad shepherds head in the wrong direction. But mostly they just let their sheep flounder, roaming wherever they wish. Their sheep wander around and can’t find their way home. These are bad shepherds. However, before we place too much blame on bad shepherds, we must remember that we’re often bad sheep. Isaiah says that we go our own way (Isaiah 53:6). We need someone to rescue us. 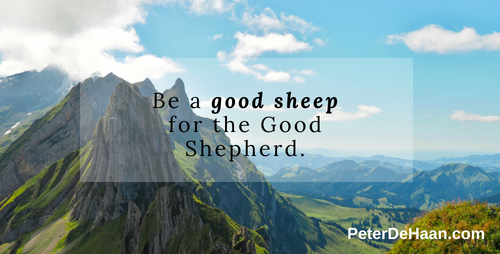 Just as our shepherds have a responsibility to us to be good shepherds, we have a responsibility to them to be good sheep. Like shepherds, another leadership role is teachers. James cautions us against becoming teachers, warning that teachers will be judged more strictly, held to a higher standard (James 3:1). I suspect the same applies to shepherds. Contrast these bad shepherds to Jesus, who is the Good Shepherd. He says so himself. As the Good Shepherd, Jesus is willing to die for his sheep. He cares for them and knows them. When danger comes, the Good Shepherd won’t run away like a hired man. He’ll stick around and protect his sheep, even if it means dying so that they can live (John 10:11-18). Even if it means dying so that we can live. Our human leaders—shepherds—sometimes disappoint us and let us down. Though most of them have good intentions, they’re flawed human beings just like us all. They make mistakes. Though they may not go to the extent of Jeremiah’s bad shepherds, they certainly aren’t on the same level as Jesus, our Good Shepherd. Thank you, Jesus, for being our Good Shepherd. You know us, you love us, and you die for us.